Bank of America is leaving the building that bears its name in Downtown Houston. But progress is being made in leasing the 56-story tower. 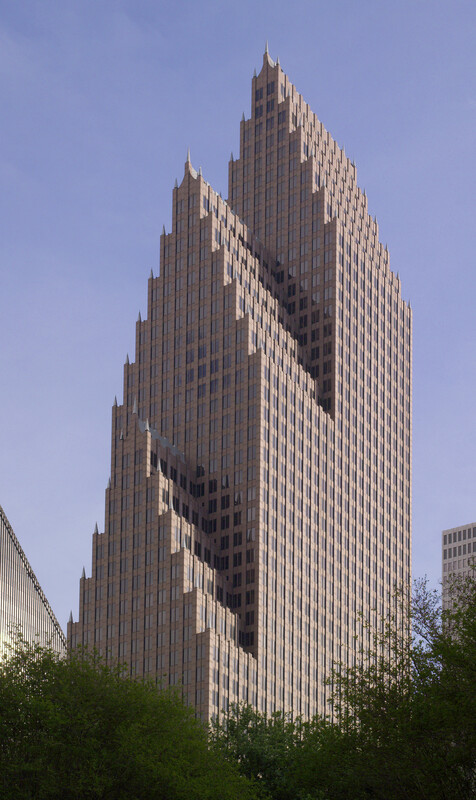 HOUSTON – The 56-story Bank of America Center is losing its namesake financial tenant. But the noteworthy tower is quickly finding other tenants for the 1.2 million SF skyscraper. TransCanada has signed a lease to expand its office space by 82,916 SF on three floors in the tower, 700 Louisiana. Now TransCanada, which acquired Columbia Pipeline Group in 2016, will occupy a total of 260,000 SF. The Bank of America building, designed by award winning architect Phillip Johnson and partner John Burgee, is located Houston’s Theater District and near Jones Hall, Bayou Place, the Hobby Center for the Performing Arts, Wortham Center and the Alley Theatre. Hines developed the tower. “After careful evaluation of alternatives, consolidating personnel into the most iconic building in Downtown Houston as soon as possible made sense for a number of reasons,” said JLL’s Louis Rosenthal, broker for TransCanada. TransCanada was represented in the transaction by Rosenthal and Bruce Rutherford of JLL. John Spafford of Houston-based PMRG represented the building ownership. Bank of America will be leaving in 2019, relocating to a new 35-story downtown building, which is being constructed by Skanska. The new Skanska building will bear Bank of America’s name. The existing Bank of America Center will have to find a new moniker. It has not been announced whether TransCanada will receive naming rights, now that it has leased 260,000 SF. Arnold & Porter recently moved from sublease space within the building to a direct lease of 21,290 SF on floors 40 and 41. Arnold & Porter was represented by Kevin Saxe of CBRE. “We are fortunate in today’s office market to have tenants that are growing,” says Spafford. Bank of America is currently over 91 percent leased and PMRG has completed over 192,000 SF of leasing activity in the last six months. While Bank of America is vacating in two years, PMRG has been working effectively to backfill that space, Spafford said. “The banks departure provides an opportunity for some modifications to the lobby, and plans for those modifications are in the works and expected to be announced in the near future,” Spafford said.